Web 2.0 technology, such as blogging, allows for locally developed, cost effective, and holistic alternative portfolio assessment systems. By enhancing critical reflection and fostering social interaction, blogging portfolios are seen as an integral learning tool for all students enrolled in a university program. As Ellis (2001) noted, metacognition is simply thinking about thinking. Metacognition in practice can serve as “the critical revisiting of the learning process” (Georghiades, 2004, p. 171). Critical reflection, as a form of metacognition, occurs when learners construct their own narratives based of learning experiences and professional practice. As applied to professional practices, approaches that support the examination of beliefs that emerge from these practices promote the development of more flexible and intentional approaches to effective teaching and learning (Sockman & Sharma, 2008). Social interaction – Students share their learning reflections in an open format. Developmental – The reverse chronological order of posts shows learning growth. Organization – Categories and tags allow students to classify their reflections. Autonomy – Students have ownership of their personal content management system. Reflective – Students consider which standards are being addressed and what key words best describe the post. Digital citizenship – Students practice using social media to enhance digital reputations (Chaplin, 2011). Barrett (2009) described how electronic portfolios can capture both the process and product of learning over time. The portfolio can be used as a workspace to document ongoing learning (process) and as a final showcase of achievements during a program (product). She proposes using blogging tools for such portfolios. Up until 2009, Seattle Pacific University was using a commercially available electronic portfolio system. In addition to being rather costly, this system did not enhance aspects of critical reflection (see Chaplin’s list above), was cumbersome, and was perceived by students and faculty as a hoop to jump through in order to graduate. A more holistic approach that fostered both the process and product side of electronic portfolios was sought. A switch to bPortfolios using the freely available WordPress blogging tool (www.wordpress.com) was implemented by SPU’s School of Education beginning in 2009. Programs using bPortfolios include the following: undergraduate teacher education, Masters of Arts in Teaching, Masters of Teaching Mathematics and Science, and Masters of Education in Curriculum and Instruction. Early during a degree or certification program, students sign up for a personal account on WordPress and set up a professional bPortfolio. The following screencasts are designed to help with bPortfolio setup: 4 Steps to Set up Your bPortfolio, 10 Questions about bPortfolios, and Assessing bPortfolios. As students matriculate through a program (courses, internships, etc. ), reflective posts documenting learning are made in the portfolio. Students add tags of keywords from the post in order to annotate content. Self-tagging is a form of personal reflection rather than social learning (Sun & Datta, 2009). Posts are linked to standards (program, state, or national) via categories. Associated artifacts including text files, graphics, videos, or links can be tied to posts to further enhance and document growth. Meta-reflections, serving as summative reflective posts, are written at the end of a course, internship experience, or other program activity. Peer and instructor feedback via the comments link on each blog post is used for formative assessment throughout a course. Summative (end of program) evaluation of the bPortfolio is conducted by faculty with a formal scoring system using rubrics. In one degree program, students self-assess their bPortfolios using rubrics tied to the program standards. When students graduate, the bPortfolio can continue to serve as a professional portfolio by the educator as they pursue jobs and higher level certifications (i.e., State and National Board Certification). Below are screenshots of several bPortfolios. Since 2009, 113 bPortfolios were created by Curriculum and Instruction (C&I) Master’s degree students. These students are practicing K-12 teachers who already held teacher certification. On average, C&I students made 46 blog posts including formative course reflections and summative meta-reflections. For the students completing this program in 2011 (the first group required to maintain a bPortfolio), the bPortfolio passing rates ranged from 89 – 95% for each of the 12 program standards with the average overall passing rate being 93.1%. Since 2009, there were 236 bPortfolios created by teacher certification students from both graduate and undergraduate programs. 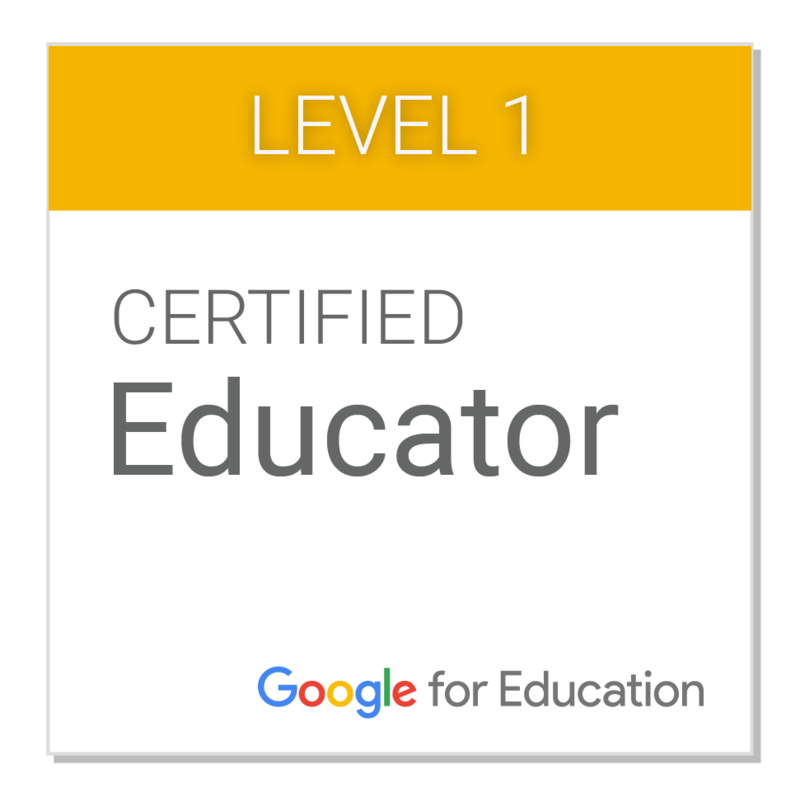 On average, certification students made 95 blog posts including formative course reflections and summative meta-reflections. The number of reflective posts by certification students is twice the amount made by non-certification students possibly due to the high stakes nature of state standards for certification. In end of program evaluations, one student describes how the bPortfolio served as a holistic tool for documenting her growth. A research study on student use of bPortfolios tags was recently conducted (Lumpe, Wicks, & Williams, 2011). The most used blogs tags were compiled and it was noted that they represented the key themes from the students’ degree programs. Due to the high stakes nature of state standards, certification students made almost twice as many more blog posts than students in non-certification programs. Students averaged about 3 tags per post and used about 40 unique tags. Students self-annotated reflective posts with a wide variety of tags. The tags co-occurred and clustered together to annotate similar blog content. Tag phrase use can significantly predict group membership (certification vs. non-certification). How does this practice relate to pillars? There is a strong interrelationship among the pillars of learning effectiveness (above), access, scale and student satisfaction. Access. Since basic WordPress accounts are free of charge, all students are able to create and publish to their bPortfolio while enrolled in the School of Education. Students document their progress through a degree program by using their bPortfolio in numerous on-campus and online courses and/or during their field experiences. In this way, the bPortfolio is an integral learning tool for all students while enrolled. One particularly beneficial aspect is that students may then continue to maintain their site upon completion of the program, as their individual accounts are not registered on a university server. In an online course discussion, one student describes why he likes having his work stored in the cloud (WordPress.com). Scale. The university can focus its time and efforts on improving instruction and student support for the bPortfolio rather than allocate funds and personnel to web-hosting, software upgrades, and software support, etc. in the bPortfolio project. In this manner, the bPortfolio is a highly cost effective approach to supporting reflective practice. Student Satisfaction. Faculty have been able to use student survey feedback to improve the bPortfolio experience for their students. As a result, student satisfaction in using bPortfolio continues to improve. Students in one graduate teacher certification program were asked to rate their overall satisfaction in using the bPortfolio on a scale of 1 (very dissatisfied) to 7 (very satisfied) upon completion of their one-year program. The usefulness of the bPortfolio site as a resource for feedback and professional growth. The ease of maintaining a bPortfolio site on a regular basis. 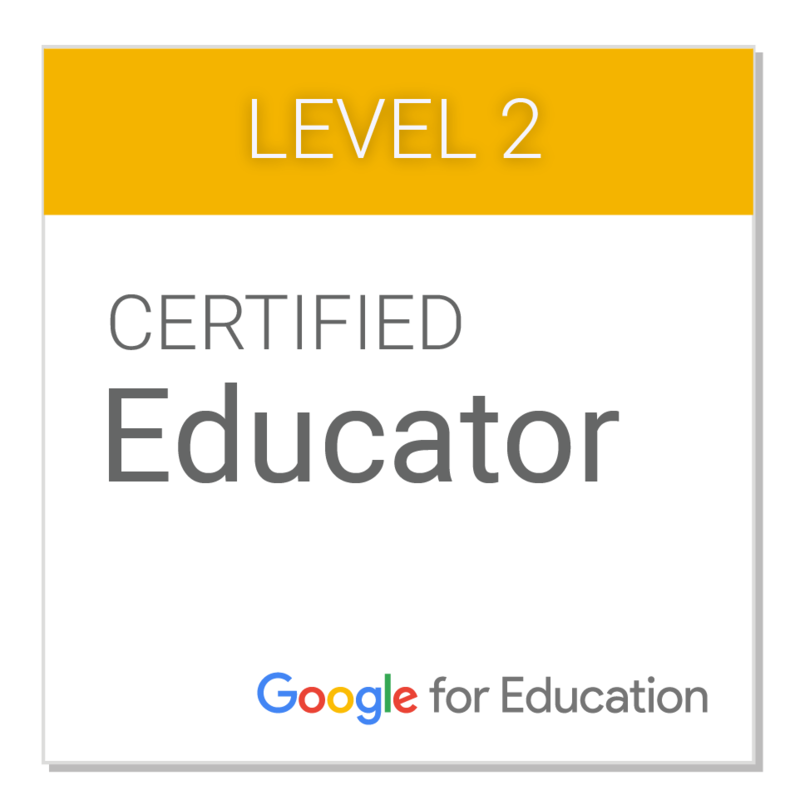 The educational value of a regular blogging requirement in the certification program. Using the bPortfolio as a communication tool with instructors, coordinators and fellow students. In an online course discussion, two students share their satisfaction with creating a bPortfolio. They also share how it helps them assess their learning and produce higher quality of work. Students only need access to a web browser and a freely available WordPress.com account. Faculty only need a browser to access student bPortfolios. Since WordPress accounts are free of charge, there are few costs involved. Students are charged a onetime $60 institutional fee to help cover the costs of ongoing training, support and portfolio assessment. 4 Steps to Set up Your bPortfolio, 10 Questions about bPortfolios, Assessing bPortfolios. 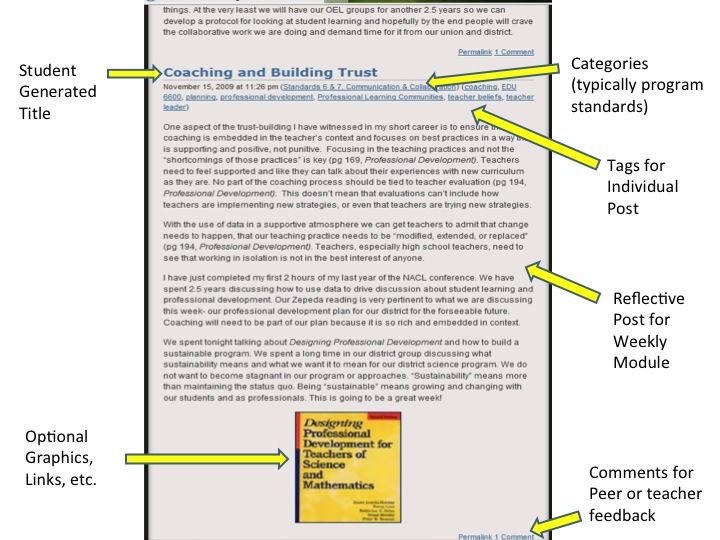 Faculty in the teacher certification programs developed their own blog to serve as a template for student organization of their own bPortfolios – http://spurescert.wordpress.com (2009-2011) and http://sputeacher.wordpress.com (2011-2012). 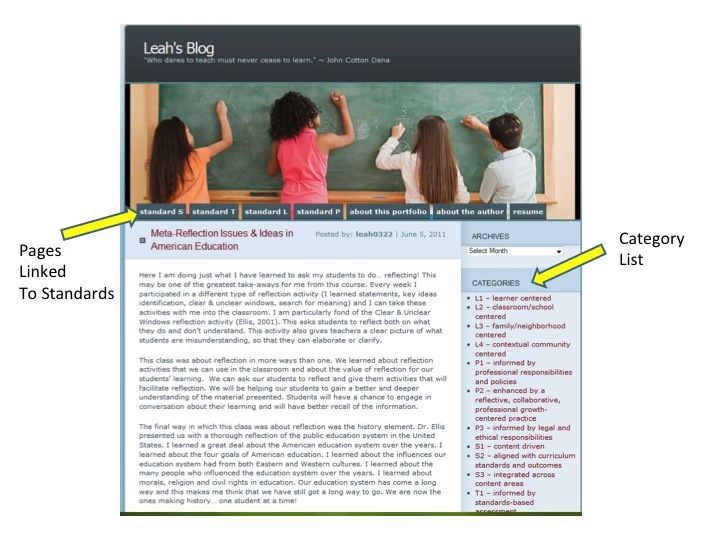 Faculty in the Curriculum and Instruction program developed a sample blog as a training tool for students as they set up their bPortfolios – http://spubportfolio.wordpress.com. A brief executive summary of the bPortfolio process was developed by faculty and is used as a training document for both faculty and students – http://www.spu.edu/depts/soe/documents/bPortfolio-Executive-Summary.pdf. A description, a scoring rubric used by faculty for evaluation, and a timeline of implementation of bPortfolios in teacher certification can be found on pages 79-83 of the Residency Teacher Certification Handbook – http://www.spu.edu/depts/soe/documents/2011-12ResCertHandbook.pdf. Ellis, A. K. (2001). Teaching, Learning, and Assessment Together: The Reflective Classroom. Poughkeepsie, NY: Eye on Education. Georghiades, P. (2004). From the general to the situated: Three decades of metacognition. International Journal of Science Education, 26(3), 365-383. Godwin-Jones, R. (2003). Blogs and wikis: Environments for on-line collaboration. Language Learning & Technology, 7(2), 12-16. Lumpe, A.T., Wicks, D., & Williams, T. (July, 2011). bPortfolios: Blog Portfolios and Self-Tagging as Reflective Practice for Teachers. A paper presented at the Sloan-C International Symposium on Emerging Technology Applications for Online Learning, San Jose, California. Sockman, B. R., & Sharma, P. (2008). Struggling toward a transformative model of instruction: It’s not so easy! Teaching and Teacher Education, 24(4), 1070-1082. Sun, A., & Datta, A. (2009). On Stability, Clarity, and Co-occurrence of Self-Tagging. A paper presented at the 2nd ACM International Conference on Web Search and Data Mining, Barcelona, Spain. Tan, Ashley (2006). 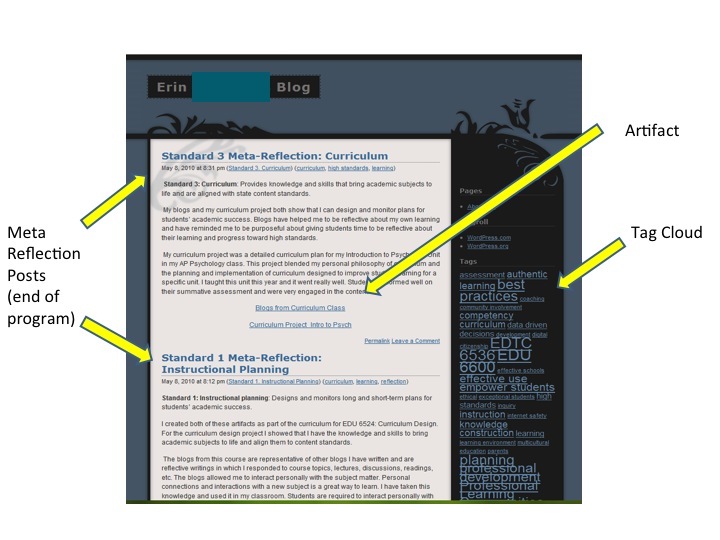 Does Scaffolded Blogging Promote Preservice Teacher Reflection? Examining the Relationships Between Learning Tool and Scaffolding in a Blended Learning Environment (unpublished doctoral dissertation). Indiana University, Bloomington , IN.